The Brazilian government faces criminal charges after a report found that the Amazon rainforest is being deforested three times faster than last year as rising food prices encourages more illegal logging. A study by Brazil's National Institute for Space Research found that destruction of the Amazon had increased 228% in August compared with the same month a year ago. Carlos Minc, the Brazilian environment minister, said the upcoming national elections were partly to blame, with mayors in the Amazon region ignoring illegal loggers in the hope of gaining votes locally. Environmental campaigners blamed the global spike in food prices for pushing soy farmers and cattle ranchers to clear more land for crops and grazing. "The tendency of deforestation rising is deeply related to the fact that food prices are going up," said Paulo Adario, who coordinates Greenpeace's Amazon campaign. "When you have elections, the appetite of authorities to enforce laws is reduced. But the federal government has to step in and do its job." The steep rise in deforestation is a sharp reversal after three years of decline in the rate of destruction. Official data showed that some 300 square miles (756 square kilometres) were chopped down last month, twice the rate of July. The minister released a list of the 100 worst individuals or companies responsible for most of the deforestation since 2005. 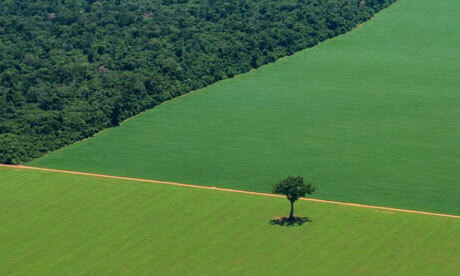 The Brazilian government's land and agrarian reform agency, Incra, was accused of being the worst. Minc said the environment ministry will bring criminal charges against all of them. The government will also create an environmental police force with 3,000 heavily armed and specially trained officers to help combat illegal deforestion. The institute, which uses satellite imagery to track down illegal logging, said the destruction was likely to be worse than figures show since no information was available for 26% of the Amazon because of cloud cover in August. Greenpeace has accused Incra officials of illegally handing over rainforest to logging companies and creating fake settlements to skirt environmental regulations. Minc said Incra was responsible for destroying 220,150 hectares (544,000 acres) of the world's largest rainforest in the past three years. The news that Incra topped the list of violators is likely to fuel the argument of large landowners that poor peasants are to blame for the destruction of the Amazon. One of Incra's duties is to distribute land to the poor. There was no immediate comment from Incra. Most of the remainder of Minc's list comprises Brazilian farmers and ranchers. Seen on The Guardian's website. Original article.